A fun part of the fangirl life is hosting or attending fandom-themed parties. I've gone to several over the years, whether they were held at a library or in my own household. Each one was unique based on which fandom it was centered around and what the party consisted of. 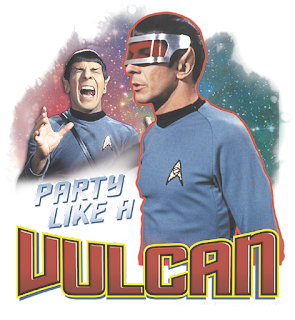 To throw a Star Trek party, you want to make sure you have everything covered: flair, food, fun, and the final frontier. You want your party to be a success, so make sure you prepare it to be one. This guide will help you through the process of planning and putting on an event worthy of the Federation. In order to make any fandom party work, you obviously have to send out invites for it. 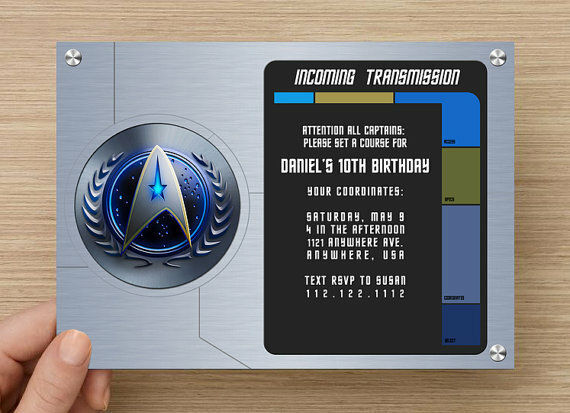 There are a plethora of Star Trek party invite ideas floating around the Internet that you can use as templates or inspiration for your own invites. Add some stars or the Enteprise, a few words in a bright yellow font, and ta-da! you're ready to "punch it." Send out your invites and wait for your Starfleet recruits to arrive. Your decorations don't have to be expensive or time-consuming. You can find simple ways to make your party have a space-oriented atmosphere and make sure "the flair" of the party continues throughout the night. Along with decorations, the most important thing for a Star Trek party is probably the food. Guests get hungry, and food is a great way to encourage socialization and keep people happy. This doesn't mean you have to provide an entire meal for every single guest. 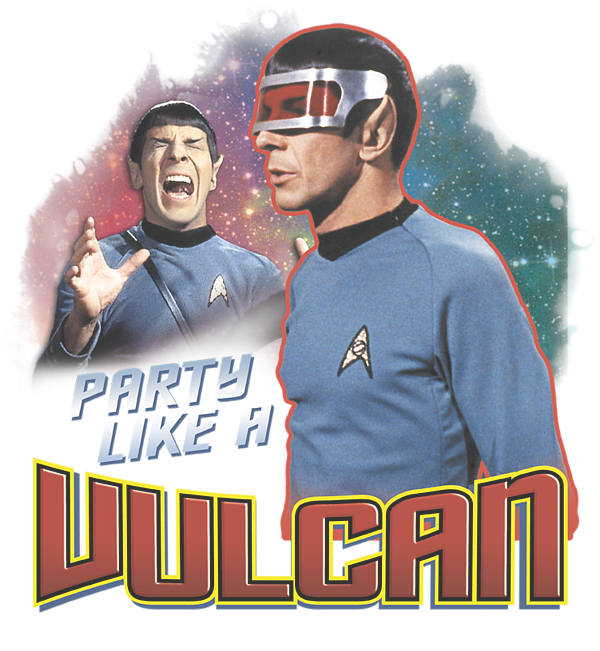 You can, of course, center the party around a Star Trek dinner, but finger food and snacks are sufficient as well. Either way, let your guests know on the invitation whether or not you'll providing a full meal, so they can come prepared for all the Plomeek Soup they can eat or just a few Algae Puffs with Earl Grey Tea. For ideas on food, you can take a look at the Star Trek cookbook or what your Starfleet favorites eat or drink within the Star Trek episodes themselves. You can have blue and red punch to mimic Romulan Ale or Klingon Blood Wine. Chocolate Rice Krispie treats can be cut to look like Borg cubes. 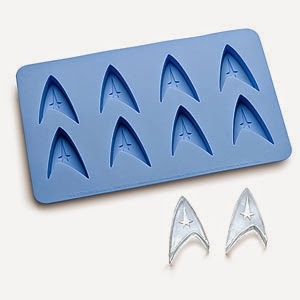 And then there are the Star Trek themed cookie cutters and ice cube trays. You can make your treats simple yet sweet and make your drinks have a little Star Trek charm to them. 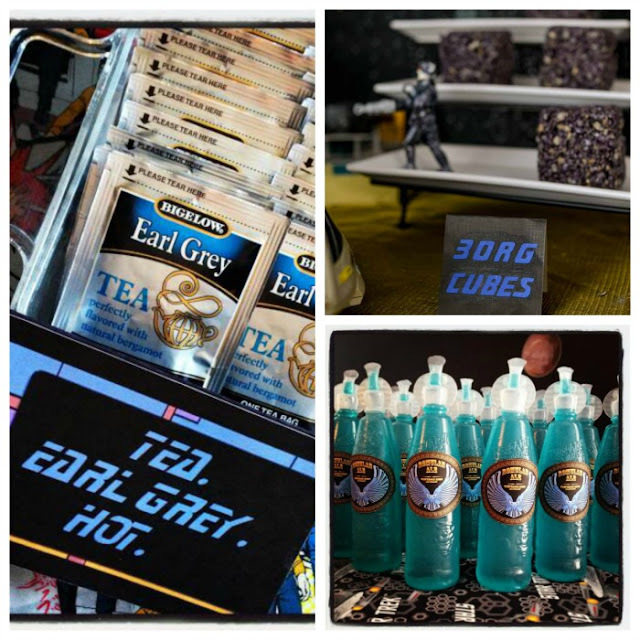 Whether you make it a full meal or just have snacks, thinking about Star Trek-themed food is one sure way to make your party a success! A party, of course, has to have more than decorations and food. There needs to be some kind of activities or games for guests to interact with. There are multiple ways you can do this. You can set up stations where guests can move freely from one activity to the next or you can create a schedule of events and activities to host as the party goes on. Some activities you could try are things like trivia challenges or quote identifications. You can challenge people to quote the opening spiel or recite the Ferengi Rules of Acquisition. You can set up a station where people can vote on their favorite Star Trek captains (or maybe their FIRST Star Trek Captain) or where they can write their name in Klingon. There could be a photo shoot area with costumes, alien face painting, and cool cut-outs and backgrounds. Photos are a great keepsake you could print out for your guests as a take-home gift. 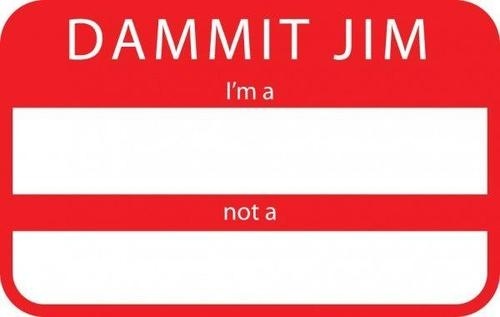 And you can always set up a cut-out of Dr. McCoy and have people fill in the quote "I'm a Doctor, Not a ___" with their own creative options. Don't forget games either! People like to be active and to have fun competition with others. You can create your own Tribbles and make a "Tribble Toss" game. Or you can use Nerf guns and cans decorated as monsters to see how many you can "stun" in a Phaser Challenge. (If you have a big enough budget, you can rent a Laser Tag kit and play "Phaser" Tag.) You can even watch the first episode of Star Trek that aired, "The Man Trap" or make your own communicator pins. 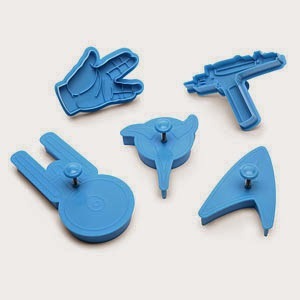 There is really no end to how many options you have to set up a fun-filled party for Star Trek. All you have to do is "make it so." At some point, unfortunately, a party has to end. And you want to make sure your end is just as good as the beginning and middle. It won't do to run around like a crazy person trying to clean up while people are tossing tribbles around the room or trying to answer trivia. Make sure you plan plenty of time for you to clean up after the guests have left. Putting a strict end-time on the invitation can help you and your guests known when it's time to wrap things up. In addition, you can really have your party end with a "photon" blast if you offer some kind of prizes for the people who answered the most trivia questions or "stunned" the most monsters. These prizes don't have to be expensive either. You can find Star Trek toys or collectibles as well as gift cards for prizes. Handing out prizes or taking a group photo signals to guests you're wrapping up the party. You don't have to immediately stop after, but you can start to give your "live long and prosper" farewells. When in doubt, you can always play the Star Trek end theme song. 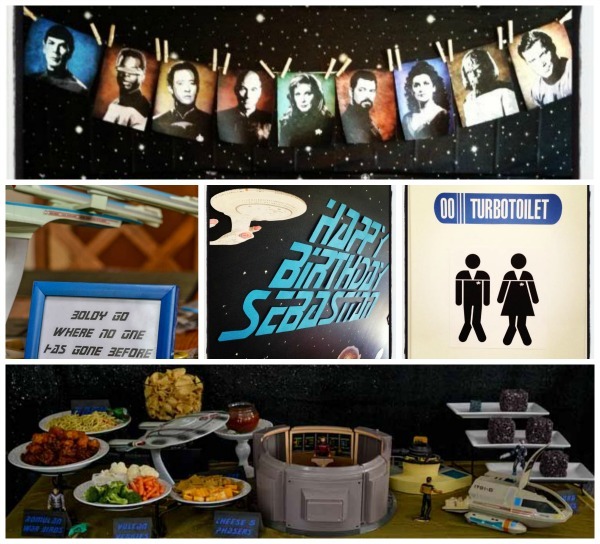 Whether you're throwing a Star Trek party or another fandom party, by making a plan and using your creative juices (or maybe the Internet's creativity), you're guaranteed to throw a fun party that boldly goes where no party has gone before! What fandom parties have you attended or hosted? 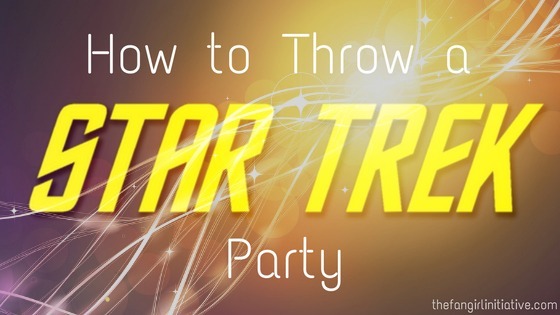 What other tips do you have for throwing a Star Trek-themed party?